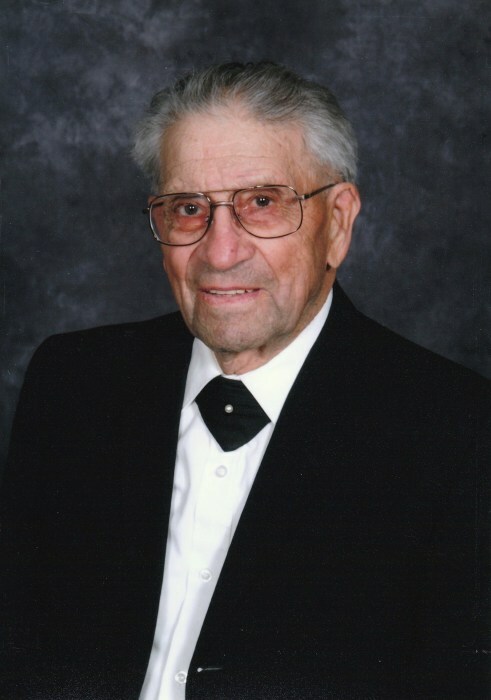 Adam Leintz, 101, of Bismarck, passed away August 23, 2018 at Missouri Slope Lutheran Care Center, Bismarck. Mass of Christian Burial will be held at 10:30 a.m. on Tuesday, August 28, 2018 at Christ the King Catholic Church, Mandan, ND with Rev. Nick Schneider as celebrant. Burial will follow the service at Mandan Union Cemetery. Visitation will be held on Monday, August 27, 2018 from 4:00-8:00 p.m. at Weigel Funeral Home, with a Rosary/Parish Vigil at 7:00 p.m.
Adam Leintz was born October 24, 1916 to Felix and Braxada (Volk) Leintz in Brisbane, ND. He was raised and educated in the Brisbane area. On May 31, 1938 he married Ella Angela Fergel at St. Gertrude Catholic Church in Raleigh, ND. They lived in Carson and he worked on the railroad and built bridges for WPA for a short time before they moved to their farm and ranch south of Raleigh. Adam and Ella lived and worked on what became their family farm for the next 45 years. During this time they raised Hereford and Angus cattle, hay, corn, and grain crops. They enjoyed square dancing with their friends at the old country school, or as far away as Amidon, ND. 4-H was major in Adam’s life; both as a parent and grandparent of 4-H members and as a leader. When St. Gertrude’s had church fall bazaars, it was Adam’s job to drive his cattle truck to pick up bingo prizes. Branding and working cattle was both a chore and entertainment for Adam. Neighbors and relatives would get together to make light work of a big job at the farm and he would return the favor. Adam enjoyed fishing for “cats” on the Cannonball River. He was very active in several organizations during his life including the Catholic Foresters, St. Gertrude Church Council, Carson ASCS office and School Board Wade District. When Adam and Ella retired to Mandan, they were active in church activities, playing cards and visiting with their neighbors, keeping up an enviable yard, and growing an immense garden. Nothing gave Adam more pleasure than sharing the fruits of his labor with family and friends. Adam will be deeply missed by his daughters, Mary Lou (Lynn) Bueling of Fargo, ND, Angie (Martin) Schaff of Mandan, ND, Sharon (Duane) Schwab of Mandan ND; son, Mike (Sharon) of Raleigh, ND; 16 grandchildren, Shari, Michael, Bonnie, Robert, Jeffrey, Brandon, Clint, Kurt, Kelly, Tammy, Julie, Robin, Kim, Thomas E., Troy, and Travis; 38 great-grandchildren; 8 great-great-grandchildren; sister, Rose Shobe, of Gooding, ID; and sister-in-law, Janet Leintz of Orange, CA. He is preceded in death by his wife, Ella; grandson, Ronnie Leintz, his sisters, Helen (Joseph) Fergel, Katherine (Ralph) Dressler, Clara (Jack) Schaff, Ann (William) Wickenheiser, and infant, Rosa; brothers, Lazarus, Ed (Rufina), John (Margie), Michael, and twin infant brother; and brother-in-law, William Shobe.